Over the last few months, international media have taken an unusual interest in both friendly and qualifying games of Hong Kong’s football team, though, the attention was limited to just those few minutes prior to kick-off. Once the “March of the Volunteers”, China’s national anthem, sounded through the stadium, roughly one third of the spectators would join into a cacophony of booing and jeering, recorded by the surrounding crowd of accredited journalists. What started as a cynical voicing of dissent in the aftermath of the Umbrella Movement – for the first time collectively practiced during the World Cup qualifying games in June of 2015, has since then become a fixed ritual at every single home game, with no indication of losing its momentum any time soon. Neither warnings by FIFA or the AFC, nor the subsequent monetary fines could put an end to this practice, eventually triggering a political reaction from Beijing. On November 4th, 2017, the National People’s Congress Standing Committee amended the annex of Hong Kong’s Basic Law by formulating a clause that requires the solemn observation of both national flag and anthem. Before this new legislation can be enforced, the local parliament still needs to pass a separate bill, a process that is expected to take at least several months. Meanwhile, the booing of the anthem continues, with growing anticipation for a legal showdown once the law is in place. Distorting a national anthem is widely regarded as an offensive breach in sporting etiquette, but the case of Hong Kong suggests another dimension of a cultural-legal complexity. Despite not being an actual nation-state, Hong Kong obtained both FIFA and IOC membership during its colonial period, facilitating the occasional paradox of a nation that would have to play against itself. When China and Hong Kong faced each other during the World Cup qualifiers in 2015, only one anthem had to be played before kick-off, while the opposing fan groups were both dressed in red and could hardly be distinguished on the TV screen. Arguably, the anthem’s role for self-identification has also remained rather limited, with the vast majority of Hong Kong citizens refraining from singing the lyrics altogether, no matter what the occasion. When the Mandarin “March of the Volunteers” replaced the English “God Save the Queen” in 1997, it certainly offered a powerful symbol for the transfer of sovereignty, but it also gained little relevance in a predominantly Cantonese-speaking Hong Kong. Nonetheless, the act of booing your own anthem remains a rare case within the current sporting landscape, and renders the disciplinary paternalism of governing bodies a bit more controversial than usual. Interestingly, this ritual can only be observed at football games, although there are be plenty of other occasions every year at which the Chinese national anthem appears. The traditionally sold-out exhibition games of the Chinese national women’s volleyball team that attract a bigger crowd than the average football match, are usually observed by an audience that offers passionate support throughout the day, and will only enter into a state of silence for the duration of the anthem. Of course, the football stadium is often categorised as a “third space” in which it is easier (and often even more effective) to perform political dissent, but these conclusions often happen without acknowledging the role of fan culture. 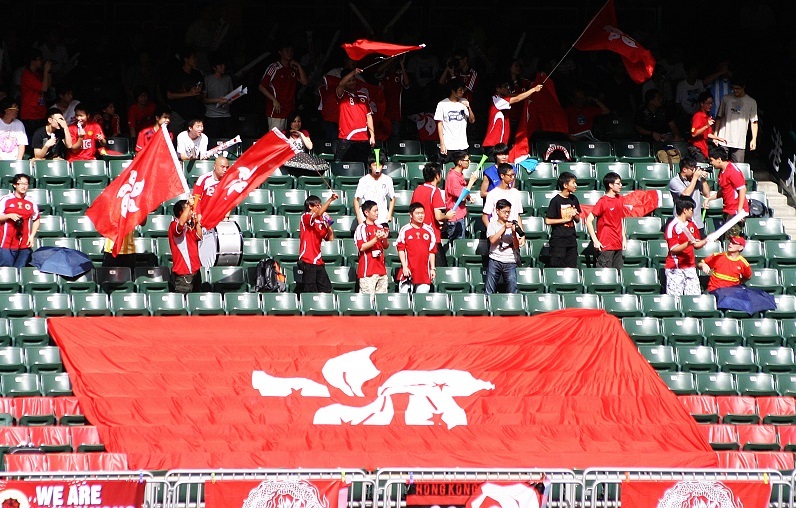 In the case of Hong Kong, local football has largely disappeared from mainstream media discourses, which also remained ignorant towards the revival of local fandom in recent years. The professionalisation of domestic football clubs has attracted a new generation of supporters to the local game, who increasingly seek inspiration from other fan groups abroad, including Japan, Malaysia, and China. The last few years have also seen the introduction of new chants both in the league and at international games, and there has been an increasing effort to adopt more Cantonese songs instead of generic English banter. This indigenisation process also increasingly involved the subcultural formation of “trolling”, which has been thriving on popular online platforms such as HK Golden or LIHKG, and eventually made its way into football stadiums by materialising online memes as stuffed toys and replicating cursing slangs next to the pitch. Nonetheless, although most of these organised groups do have clear political tendencies, they generally refrain from public calls for dissent or protest. This means that the booing of the anthem should not be seen as a political movement encroaching the domain of sport, as it is often portrayed in media. Instead, it has been embedded in practices of an emerging fan culture in which dissenting voices make up a significant proportion. With the absence of coordinated action, it is difficult to predict its persistence, and meanwhile, there has been growing concern among fans how the booing might adversely affect the development of local football, as shown by the growing tension between football fans and journalists during match days. Many might still think that Hong Kong football has been trapped in its own insignificance, but forcing a change in the city’s constitution could as well be understood as a sign of its lingering importance. The shared passion for the “beautiful game”, both in Hong Kong and the Chinese mainland, might for the time-being be more unifying than the national anthem itself. Tobias Zuser is a guest lecturer at the Education University of Hong Kong and a fellow at the China Soccer Observatory. He also hosts the weekly Hong Kong Football Podcast. Image Credit: CC by Tak Lau/Flickr.